The Indian flute is one of the oldest instruments in India. Poems in Sanskrit and Hindi praise the sound of the bansuri. One of the poems reads: “When Lord Krishna is playing the flute, even the little calves were so charmed by the divine melody that they stopped to drink water from the river Yamuna and to suckle milk from the udder of the mother cows. Even the flow of Yamuna dried up as it was so enchanted by the flute music. With the Indian flute and it’s emotional expression you always combine the love of God, a love without the intention for personal happiness. 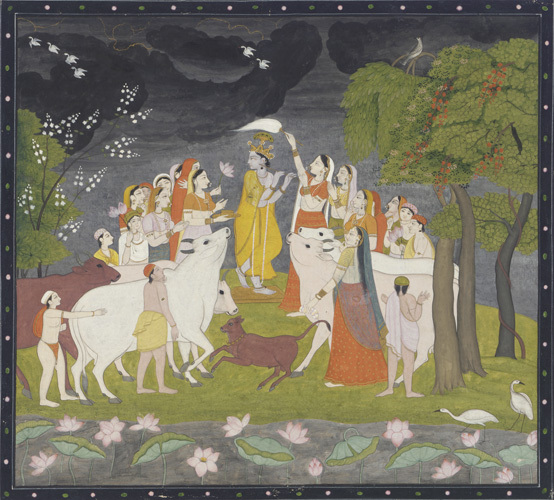 It is Shringara-bhava, it is symbolized between Krishna and Radha, one of the Gopis, the cow herd girls. The In Hinduism the Gopis belong to the most intimate circle of lovers of God. Krishna is the incarnation of Vishnu, in representations always easy to recognize in lilac as full body colour. In the ancient musicological script Naradiya Shiksha (600 A.D.) the bamboo flute is described as a kind of tuning fork, for the recitation of verses n from the Samaveda, which is one of the Vedic scriptures. In the medieval treatise Sangeet Ratna kara (1247 AD) the Indian flute is described in 15 different designs. 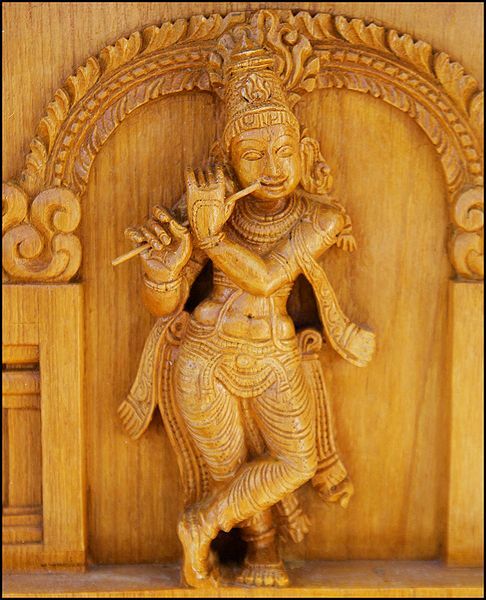 For the Indian flute there exist a variety of denominations. The different namings are lead back to the frequent description in poetry, where Krishna playing his flute is described. The word bansuri originates from Sanskrit. Bans means bamboo and Swar is a musical note. The bamboo flute is also called Bansi, Venu, Murali, Algooz or Vamshi. The bansuri is applied in its design as a transverse flute and is originally from the Indian folk music. Only in the 20th Century the Bansuri has been introduced in Indian classical music. The bansuri is now an established representative of the North Indian classical music. Also in the South Indian classics the bamboo flute has taken hold. Here it is called Venu. Compared with the bansuri the Venu has two holes more. The bansuri is equipped with six regular holes (+ blow hole), that Venu has eight. This entry was posted on November 14, 2011 at 11:04 pm	and is filed under ENG (English), IMC OnAir - News. You can follow any responses to this entry through the RSS 2.0 feed. You can leave a response, or trackback from your own site.